We did it! After 8 wonderful years together, we got married ourselves in June and we couldn’t be happier! 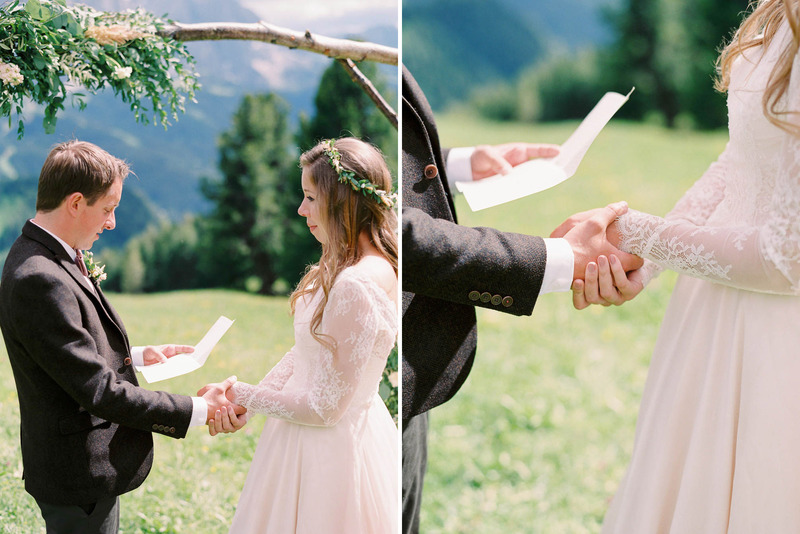 From very early on in our relationship, we always knew that we would want a small, intimate wedding in the mountains. 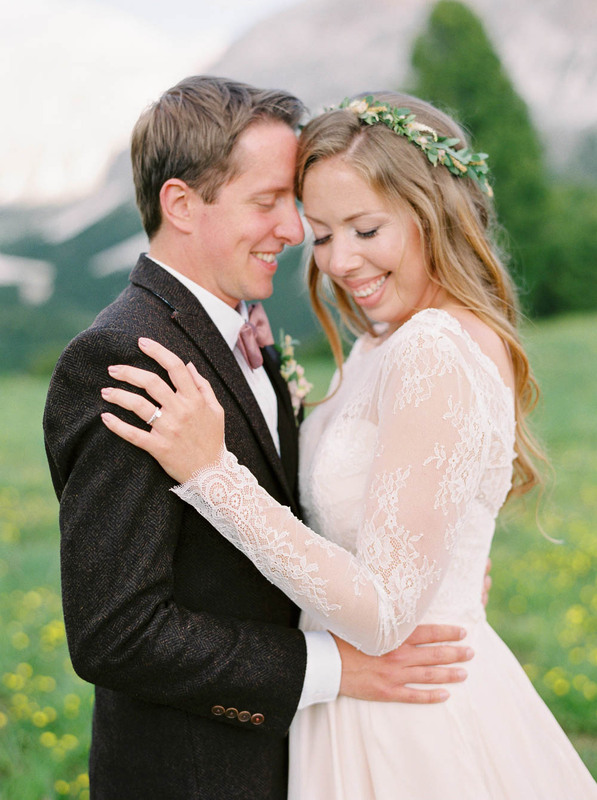 I’m originally from Bavaria in the South of Germany, so the Alps have always had a special place in our hearts! Some of our earliest holidays and memories involved borrowing the family car and driving down through Austria, Switzerland and Italy, and the scenery always took our breath away. 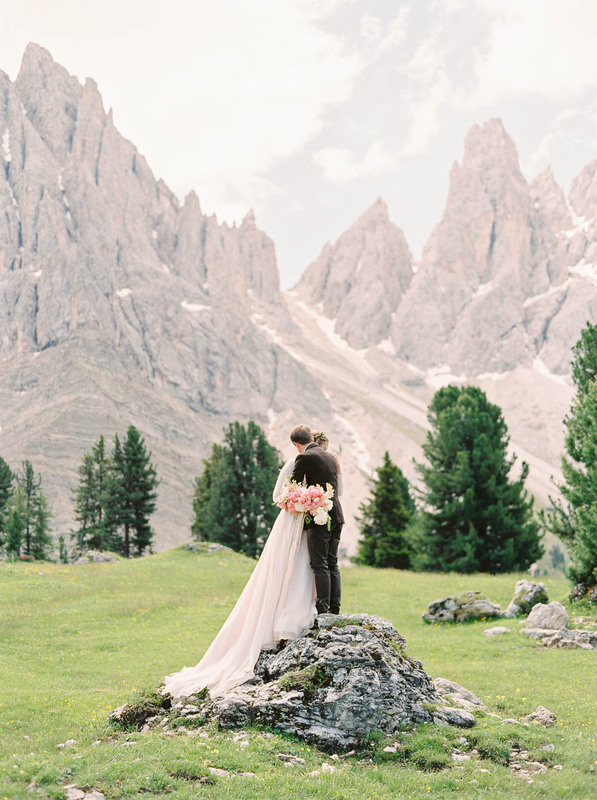 After months of indecision we finally set our hearts on a location in the Dolomites in Northern Italy. 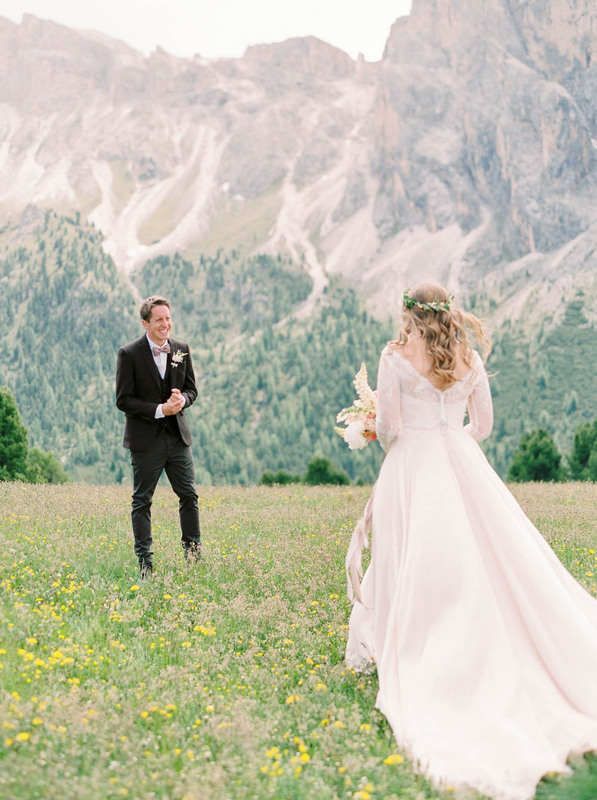 We both agreed that whatever the weather we wanted to have our ceremony outdoors, and the meadow we found couldn’t have been more perfect. 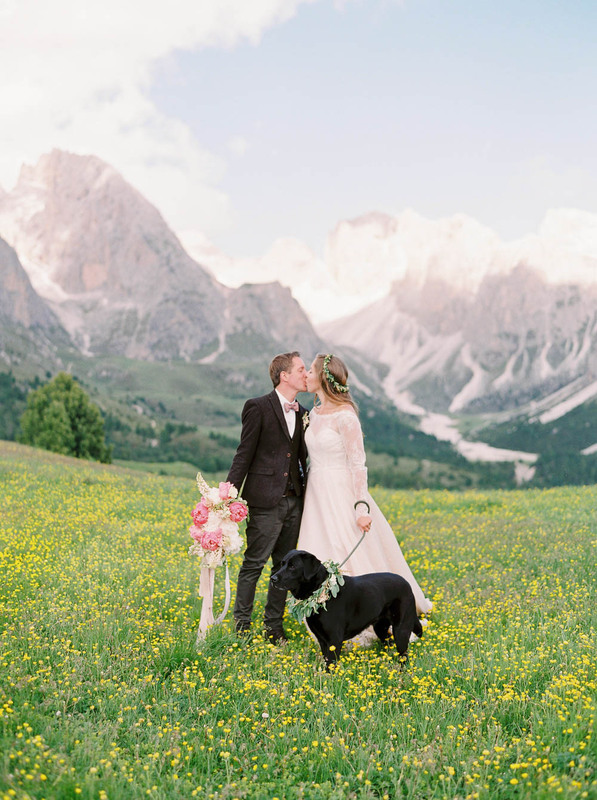 Surrounded by dramatic mountain peaks, and bursting with wild flowers and pine trees, it was the location of our dreams! As our immediate families are both very small, we took Catherine’s mum & sister, my dad & brother, (and of course our dog Luna!) to the mountains for four days. We all spent a couple of days hiking in the fresh air, eating stunning local food, and relaxing in the spa before the big day arrived. 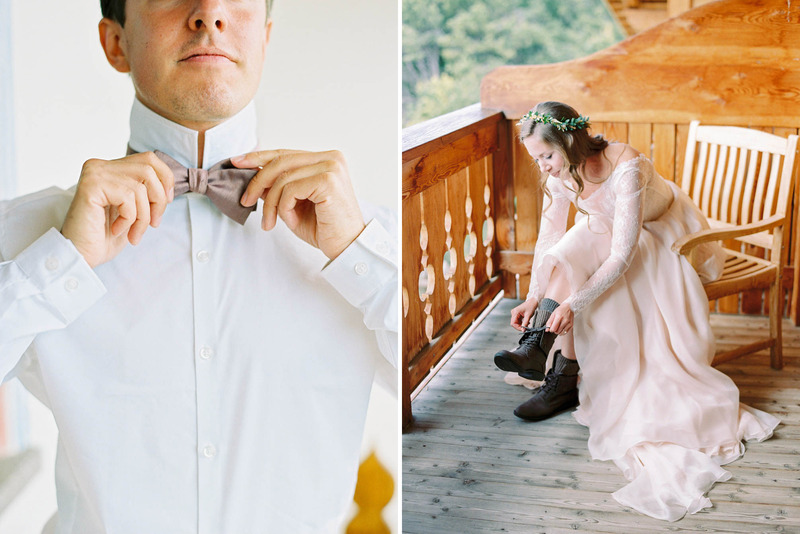 We chose to skip a lot of the formalities – we didn’t have any speeches, cut a cake or do a first dance. 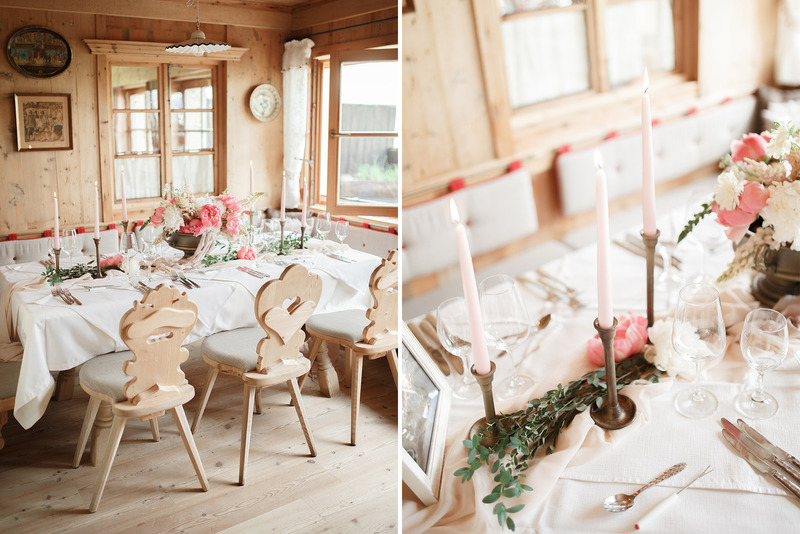 It was just an outdoor ceremony (which was deeply personal and emotional) followed by plenty of good food, drink and company in a cosy alpine lodge. Our suppliers very generously agreed to keep two dates open for us so we could have a backup plan in the event of bad weather. It was very reassuring to have the choice, but also created its own pressure to make the right decision! On the Sunday night we looked at the forecast, and decided to go ahead the next day – we confirmed with the suppliers that it was all stations go! After a somewhat restless night we woke to low cloud and a little drizzle, but decided to carry on as planned. 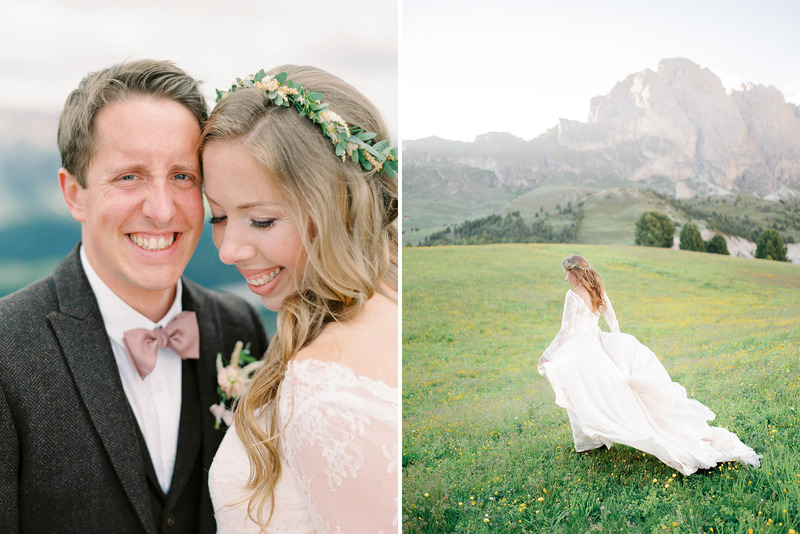 Catherine had her hair & makeup done with her family, while my brother and I helped our florist Lynsey and her husband transport boxes of blooms up the mountain in the cable car. The pieces of flower arch thankfully just fit! 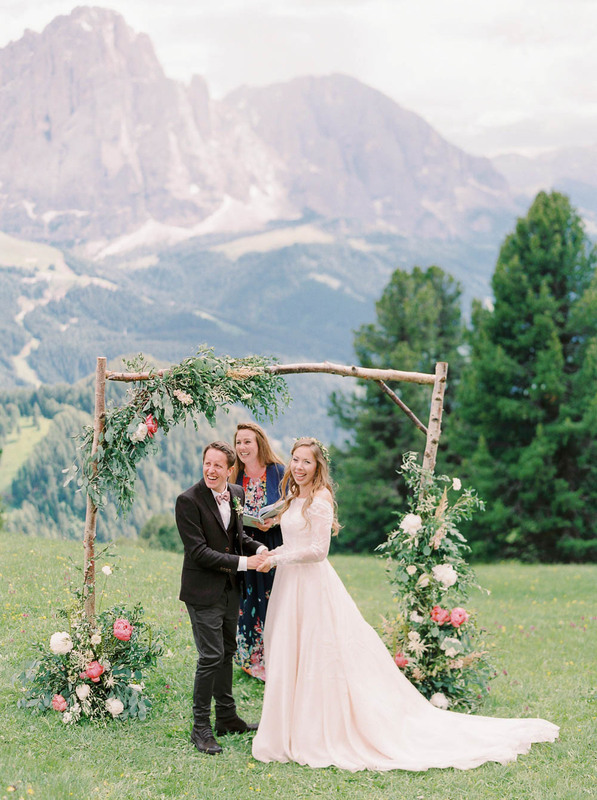 Once we were both ready, we headed outside for our first look – I can still remember being more excited than nervous, standing out in the meadow waiting for Catherine to arrive! It was such a beautiful moment to see Catherine in her dress for the first time. Having photographed hundreds of brides, I always knew the style of dress Catherine was drawn to, but I was still just blown away by what I saw. The movement in her dress was incredible! 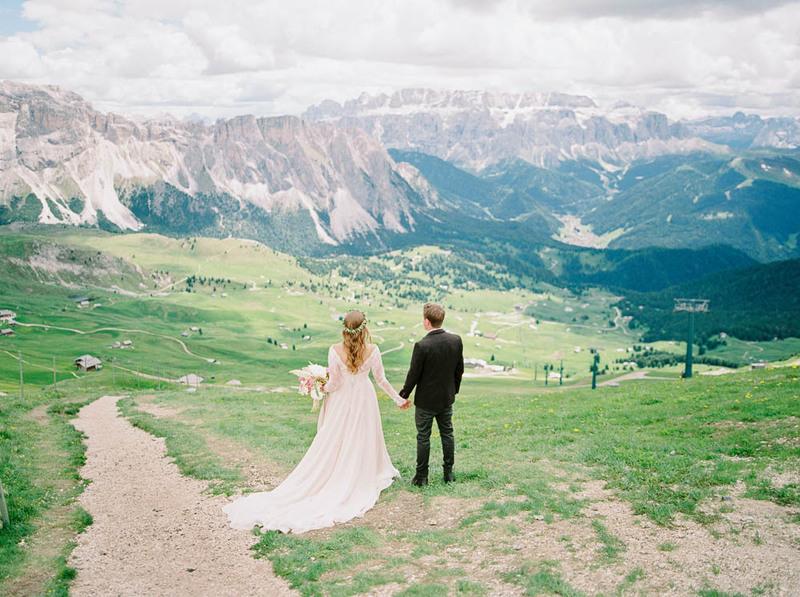 After taking a special, memorable moment together we headed to the top of one of the nearby mountains for some couple portraits. We needn’t have worried about the weather, which was nothing short of glorious all day – warm and still without even a breath of wind. 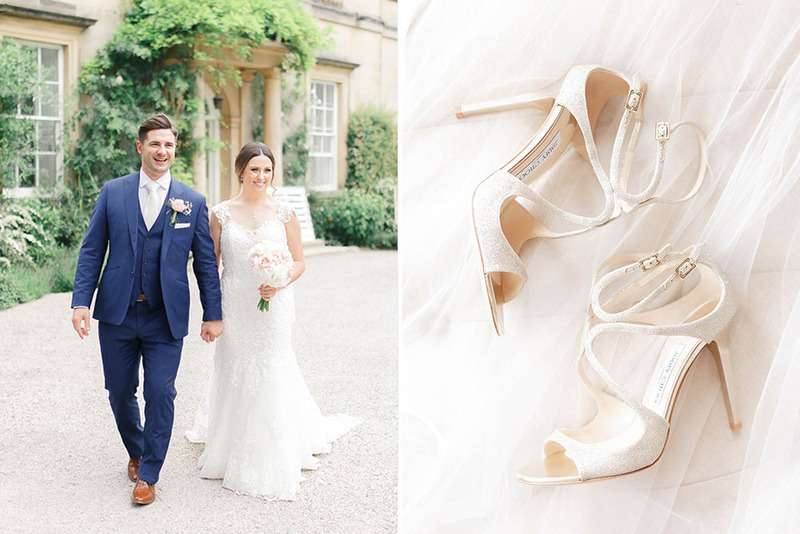 As I’m sure you can imagine, finding ourselves in front of the camera when we’re usually behind it was a very surreal experience, but Justine Milton and her husband Alan did a fabulous job of putting us at ease and capturing some lovely portraits of us! 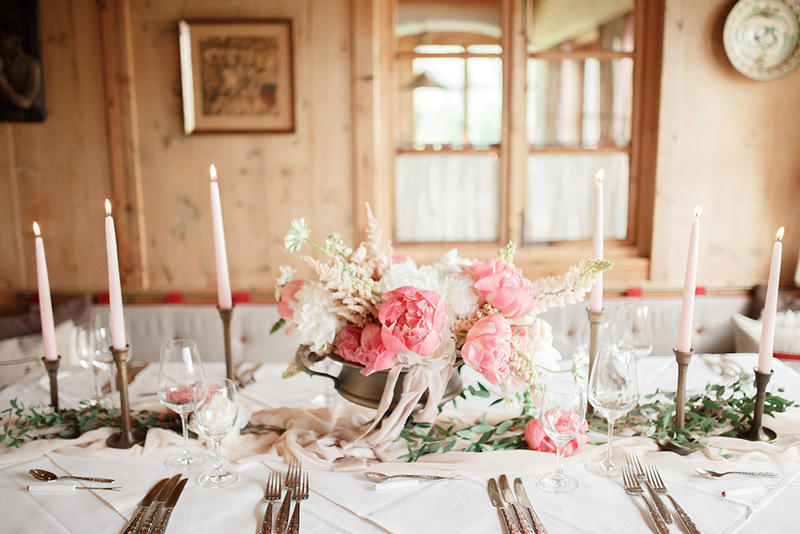 We wanted the styling of our day to be relaxed but romantic, and it was important for everything to look at home in the natural setting we chose. 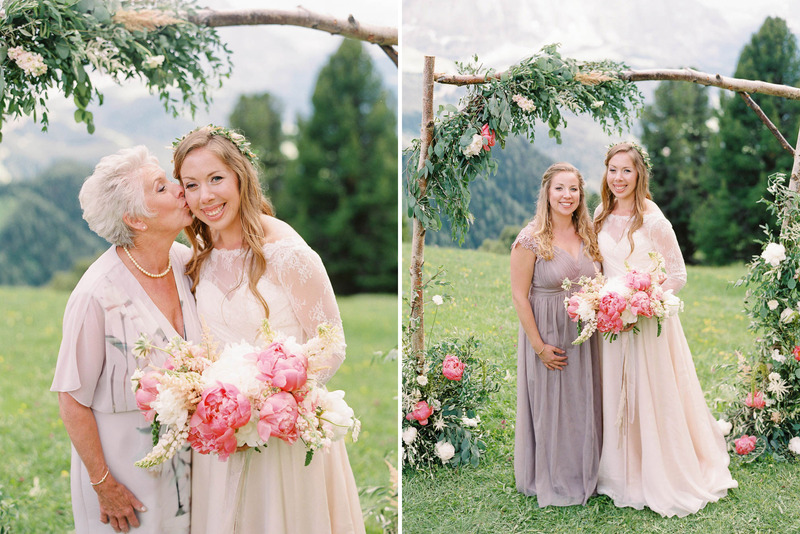 Catherine absolutely loves flowers and gardening, so her bouquet was very important to her! 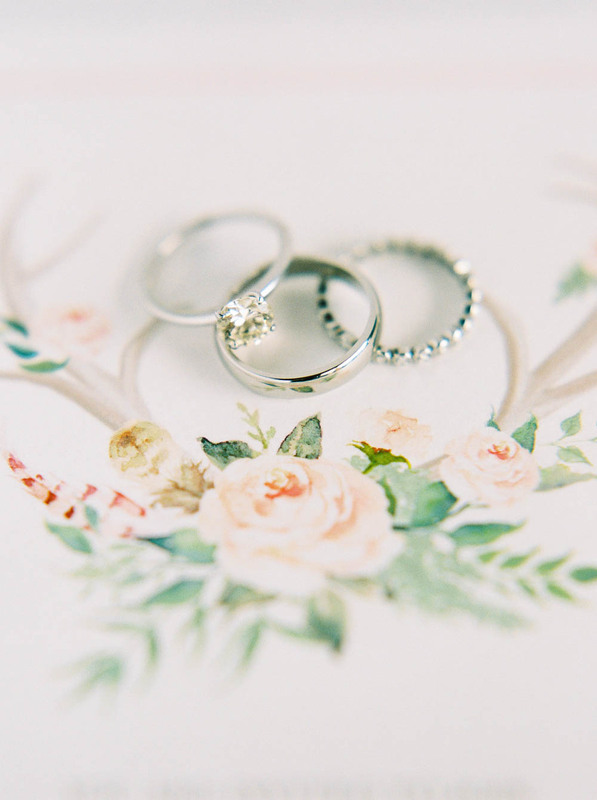 One big bonus of getting married in June was that lots of her favourites were in season – peonies, foxgloves, lupins – big, statement, blousy blooms in soft shades of pinks and whites. 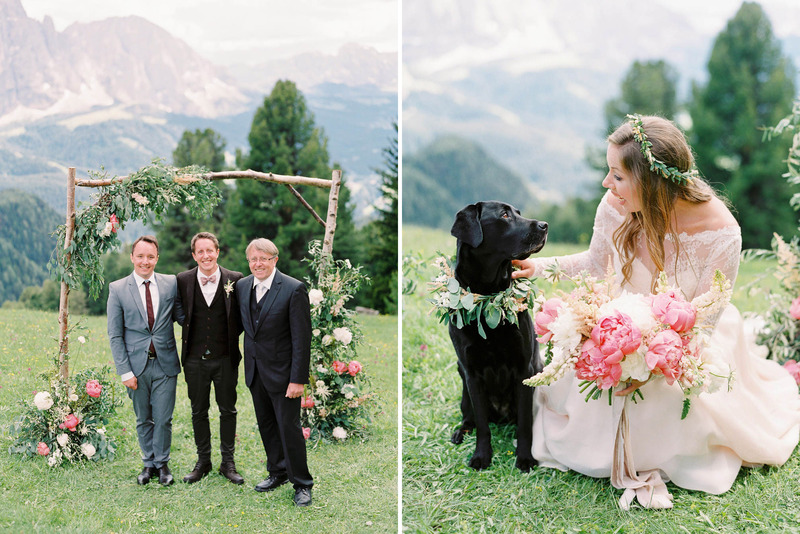 She asked for a really sizeable, free form bouquet – she barely put it down she loved it so much! 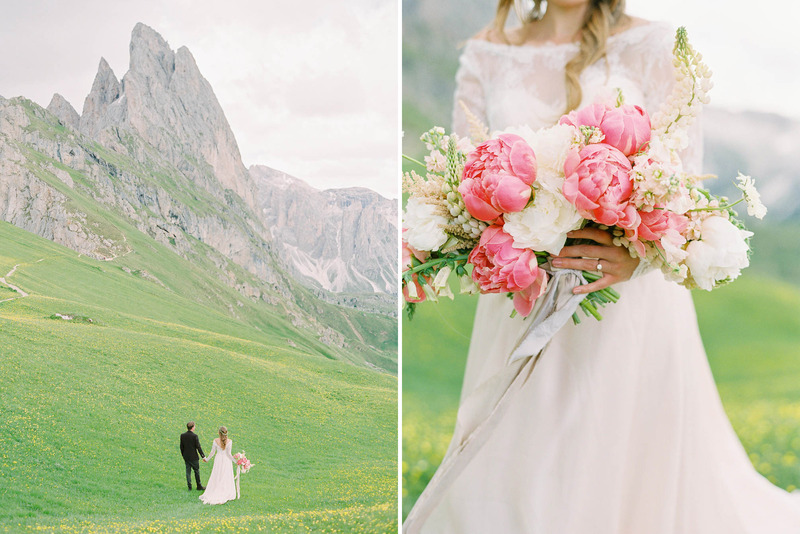 Her dress was a delicate shade of blush (actually called ‘peony’ by the designer, Martina Liana, which seemed like a sign! ), and the lace sleeves were a bespoke addition. For my suit I wanted something that was a bit different, but still had a fairly classic feel. In the end (after trying on more suits than Catherine did dresses!) I found a chocolate brown, lightly textured wool jacket and waistcoat, which I paired with brown chinos and brown boots. Catherine also had boots on under her dress! Late in the late afternoon, as the sun shone, we joined our families for the wedding ceremony. I don’t think I’ve ever cried in my adult life, so it was shock to everyone when I shed a tear or two watching Catherine walk down the aisle. 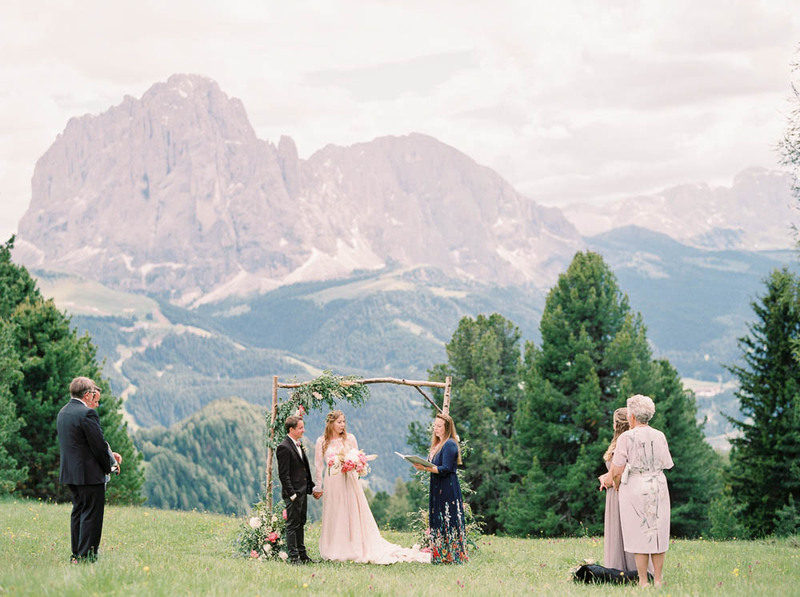 We had a personalised ceremony under a floral arch, which included our own vows and promises to one another – this was without a doubt the highlight of the whole experience for us. It was incredibly special. 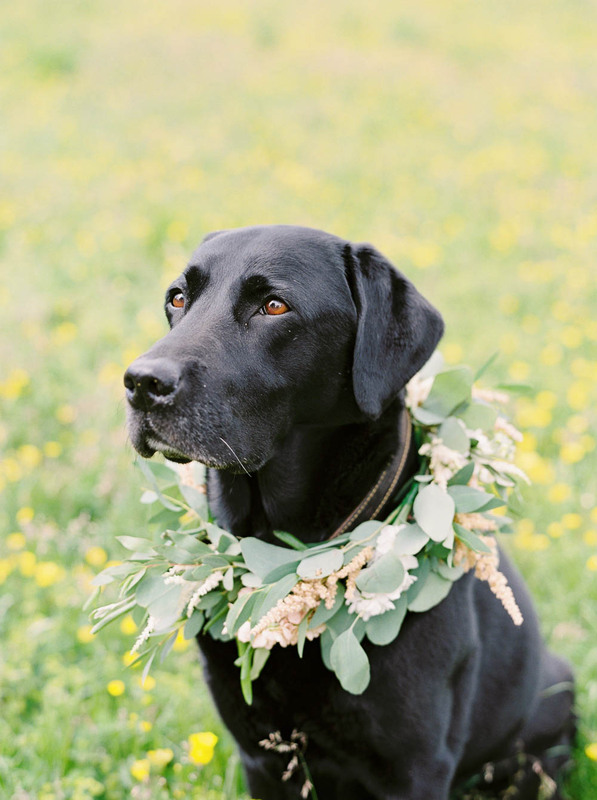 Luna had her own beautiful floral collar (made from the same blooms as Catherine’s bouquet and flower crown) and happily dozed her way through the ceremony. Afterwards we had a few more photos with our family, before enjoying a bottle of champagne at the lodge as the sun lowered, then retreating for a spectacular 6 course meal! We celebrated until late with our loved ones, and made so many memories – our hearts were bursting! The day after the wedding we headed out for one last adventure, in a location which was too far to visit on our wedding day. We had our photos taken in front of the mountains while our families hiked up to join us! After Justine & Alan left (and Catherine had changed out of her dress behind some pine trees!) we hiked back out with our family. I was still wearing my suit, and had Catherine’s wedding dress in a bag over my shoulder while she carried her bouquet 🙂 Sweet strangers kept congratulating us, which was so kind! On the last morning, a wonderful sense of joy and contentment washed over us. 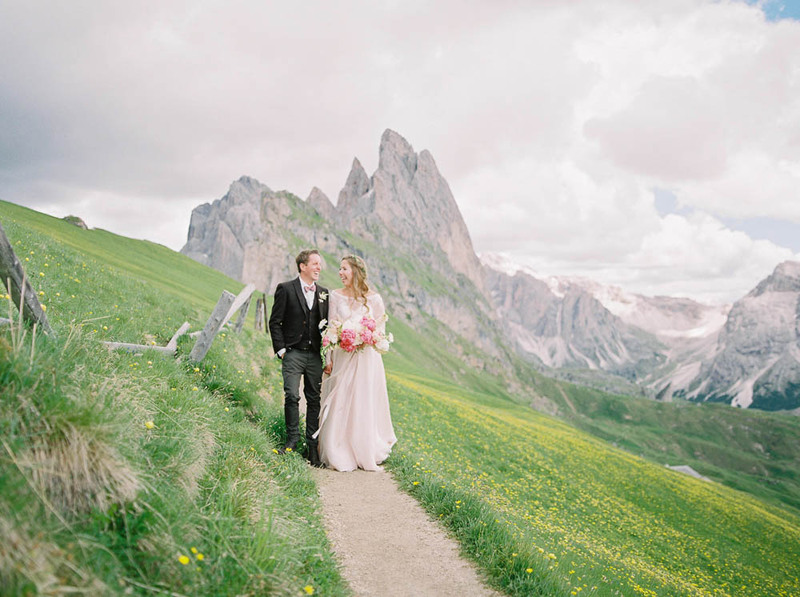 We couldn’t believe how fortunate we had been – the trip and the wedding day had gone so smoothly, and crucially the weather had been kind. The whole experience was everything we had hoped it would be, and so much more, and we will cherish these memories for the rest of our lives.